September is right around the corner. The school supply circulars are in the newspaper. The leaves are whispering that fall is coming...I can practically hear them. I have a big queue of nonfiction and chapter books and back-to-school books, all ready for review. But summer isn't over until the sunburned lady sings, people, and I ain't singin' just yet. 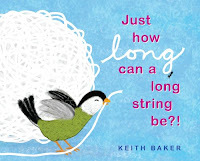 What's say we have one more afternoon on the picture book playground? 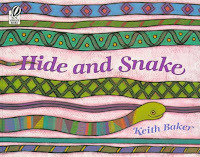 Another early childhood book that takes a concept to its limits. And never hears approaching hisssss. Espies the furlickt mouse's sheen. With no shortage of the kind of suspense that keeps eyes wide, acrobatic acts of portmanteau abound, verse winding and then pivoting on its own lyrical scheme with the hypnotic charm of a witch casting a midnight spell. Against the dark palette, the moon illuminates every page like a flashlight on a secret, nocturnal world; the illustrator's stylistic mix of realism and fancy is fitting. 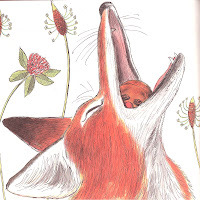 Though the connections to Carroll's work are plain, it's hard not to also be reminded of good ol' Beatrix Potter's TALE OF PETER RABBIT in a small creature's brazen oblivion to warnings, and the comeuppance of a good scare. ONCE UPON A TWICE ends with the suggestion to "be forewarned," but like the Disney Alice, you can be sure that "I give myself very good advice, but I very seldom follow it" is a more likely mantra for children and other small creatures. They know their own capacity for mischief and adventure...even the likelihood of it, surely...and at the completion of these pages, they can hold it like their own secret in the dark. 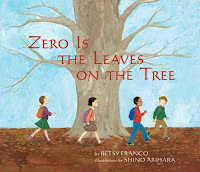 More beautiful language in a picture book. "...the balls in the bin at recess time." "...the sound of snowflakes landing on our mitten." "...the kites in the sky once the wind stops blowing." To read or not to read (fairy tales), that is the question! 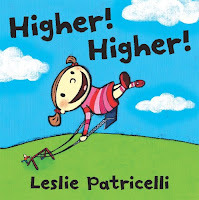 Today, we have two terrific but tricky books that invite us to consider our audience. 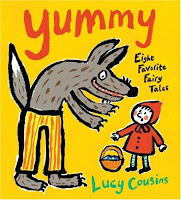 Always yummy is the artwork of Lucy Cousins, famous for her Maisy series and recognizable for her bold, black-outlined gouche illustrations that remind us immediately of work done on an easel in a primary classroom. Here, she offers us a collection of eight classic tales for the nursery (Red Riding Hood, Three Billy Goats Gruff, Enormous Turnip, Henny Penny, Goldilocks, Little Red Hen, Three Pigs and Musicians of Bremen)...well, maybe a nursery with an occasional odd shadow thrown on the wall. As Cousins did in her wonderful NOAH'S ARK, she creates a straightforward, age-appropriate piece that doesn't resort to the revisionist, even if it will ruffle a reader here and there. 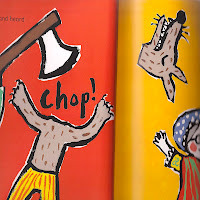 I was most concerned with an illustration in which the woodcutter gives a wicked wolf's head a clean and onomatopoetic "chop," until I remembered a similarly unsettling illustration in Paul Galdone's THE GINGERBREAD BOY in which the cookie hero is gobbled down in one gulp, which has dependably elicited screams of delight in every storytime. Likewise, when I shared this aloud, the response was less of horror than collective arm-crossing satisfaction that justice was served and swiftly, and moreover, that there is NO BIG BAD WOLF LEFT to harass, say, us. Well! (Insert hand-wiping motion here.) What proved a far worse problem in this reading was reading aloud the story of "Henny Penny" and repeatedly pronouncing "Cocky Locky," and, somehow worse, "Goosey Poosey" amidst a snickering young audience. I don't know what they do in Lucy Cousin's England, but here, it seems even the little kids watch cable. 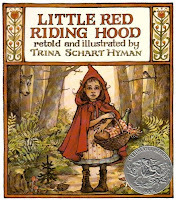 Please also check out the remembrance of reading Little Red Riding Hood by the late genius illustrator Trina Schart Hyman. 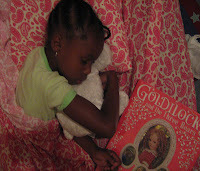 I think her pictures speak a thousand words in defending the drama of fairy tales for young children. 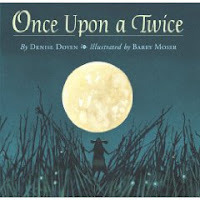 I'm am a fairy tale purist, but I can't resist telling you about this pretty, precious revisiting of a classic tale that had me torn. 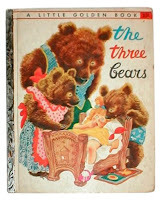 Three chairs, three beds, three bowls of porridge...there were also three things that bothered me about this retelling. 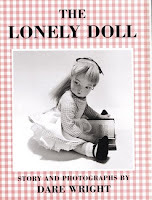 One: the stylistic perpetual changing of font sizes throughout, characteristic book design of Child's successful and charming Charlie and Lola series, but not necessary everywhere. 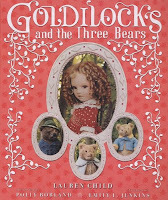 Secondly, in this version, Goldilocks has a motive in her breaking and entering: someone needs to help her clean her little red shoes that her mother has asked her to keep tidy, but which she has dirtied most accidentally and with no bad intention. How well-adjusted! What a planner! Pah! I much prefer the adorable, bouncy-curled bad seed of a Goldilocks, who breaks and enters with nary a motive but her own shocking sense of entitlement, one who is naughty so that the reader doesn't have to be. Finally, what I love about the traditional telling (like the one by Feodor Rojankovsky) is how unfettered it is; I know exactly what happens next and exactly where it will end, and at bedtime, that is a very good thing. It takes a while for Goldilocks to arrive at the house (and the action), and there were moments in this reading where I felt like shrieking "sweet Mother of Heaven, where are we GOING with this?!" induced by sentences like "I am sure you will not be surprised to hear that..." and that Small Bear "was a sensitive type" and "I know it's strange to find bears living in a little wooden cottage, but this is a fairy tale..." Yes, yes, I know, but chop-chop, do you know it's 9:45 and before me there is a little girl with eyes still as wide open as windows with broken shades?